Last Friday, the Tsukiji Market held its final auction. The 83-year-old exchange and major Tokyo tourist attraction is moving to a new waterfront location in Toyosu. 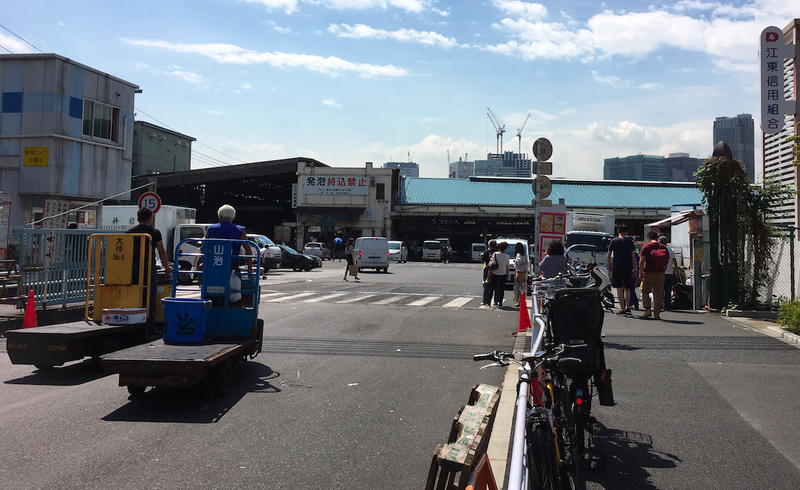 Soon, the Tsukiji Market will be gone. Nobody seemed to tell the throng of tourists flooding out of Tsukiji Station earlier this morning. With the auctions over, I wondered if people would still come. The outer market at Tsukiji. The outer market was bustling, jam-packed with people eating, shopping and taking photos. When the fish market relocates, the outer market will stay behind. Even without the fish auctions, the outer market offers an array of shopping and eating experiences that are increasingly dwindling in Japan with the proliferation of shopping malls and supermarket chains. An outer market food stall. An outer market vender selling Japanese pickles. An outer market stall selling dried fish products. But I wanted to go to the inner market one last time before it closes on September 29. This is where the Tsukiji workers eat their meals and buy necessities like rubber boots. Some of the stalls and restaurants will move to the new location. Some will close forever. The Tsukiji Market opened in 1935. Parts look like they haven’t been renovated since. It was originally built as a replacement for the Nihonbashi Market, which was damaged badly during the Great Kanto Earthquake of 1923. Over the past three decades, the number of fish vendors and sellers at Tsukiji has dropped by nearly half. In the Nikkei, former Tsukiji fish trader Naoto Nakamura explained that fisherman are now apparently selling their best fish to supermarkets, who can guarantee better prices. According to Nakamura, that means the fish that ends up at Tsukiji have been the second-raters. While there are fewer fish traders, the number of tourists has skyrocketed. Japan continues to set records for foreign visitors. High on the lists of tourists is Tsukiji. It’s been a blessing and a curse. Flier posted in the inner market. The word the sake vendor used was “jama” (邪魔), which literally means “obstacle,” “hindrance” or “disturbance.” Typically, Japanese people do as much as they can to get out of the way of others, but even if you are attempting to do likewise at Tsukiji, it’s so crowded that you cannot help but feel like you’re getting in someone’s way. Tsukiji workers, for the most part, handle the situation with aplomb—unless you are touching the fish, which is inexcusable, or generally being a jerk. The decision to move the market is controversial. As Nikkei reports, there has been discussions since the 1950s, but apparently it wasn’t until 1999 that former Tokyo governor Shintaro Ishihara made the call. It’s been delayed repeatedly, most recently for contamination concerns at the new site. “It’s going to be really different at the new location,” I said to the woman sitting next to me at Senri-ken, an inner market coffee shop. I was planning on eating sushi today, as that seemed to be the logical decision, but walking around the market was like taking a trip through time. The signs, including their letters and fonts, reeked of styles popular during the first half of the Showa Period (1926-1989). I started feeling nostalgic and wanted to eat Showa-style food, so I headed over to Senri-ken. It’s where many fish traders eat breakfast. There was no line, but inside the place was packed. I ordered cream stew, toast, salad and coffee. I broke the poached egg into the cream stew and mixed in the runny yoke. I took a bite. It was warm and comforting. The coffee was excellent, too. I looked up above the coffee pot. Years of steam has caused the lacquer above the counter to peel, revealing the grain underneath. Metal cabinets no longer gleam, and flames flickered through the tiny slots in the gas heater. It’s cramped, but comfortable and welcoming. The coffee shop has decades worth of character. All that will be lost. I finished up my coffee and sat at the counter for a moment before paying and leaving. When I first came to Japan 17 years ago, there were more old Showa-style places like this in Osaka and Tokyo. Years and years ago when these cafes and restaurants opened, they were shiny and contemporary, most likely replacing what had existed before. I don’t begrudge the lost of these retro establishments, because that’s the nature of things. A contemporary building towers of the inner market’s outskirts. Something else takes their place. Perhaps decades from now, future generations will have similar nostalgia. The Toyosu Market will open on October 11. The new location won’t give visitors an inside look at the auction. Instead, visitors will watch the action from behind glass. While that might be a shame for tourists, I can understand why it’s necessary to make the change. As Tokyo Cheapo explains, the new fish market won’t charge admission, but visitors can no longer purchase fish directly from the vendors. Instead, you’ll have to buy from the approved food stalls. T-shirt vendor in the outer market. No doubt, it will be a different experience. But I feel like even more than that will be lost.